In this work, specific attention has been duly paid to the presentation of each chapter that essentially includes: brief introduction, theoretical aspects, classification, neat and vivid diagramatic illustrations of figures-graphics-equipments, lucid explanations, supportive classical examples, and profusely supplemented with explanatory 'foot notes'-references in addition to further reading bibliography. The text content runs over ten chapters that may prove to be of paramount interest and enormous readability not only confined to the B.Pharm, students but also to various M.Sc., academic curricula in such disciplines as : Food Microbiology, Environmental Science, Microbiology etc. Key features include : concise and exhaustive presentation of scientific informations from several sources; a wealth of theoretical information that opens newer possibilities; detailed classification of various microbial aspects; pharmaceutical assays and methodologies; comprehensive index includes significant terminologies; and, well documented statement of facts. 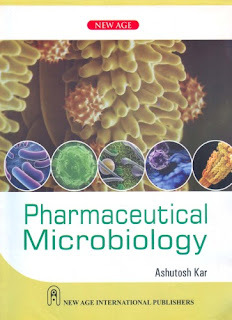 About the Author: Ashutosh Kar is a well-known Professor of Pharmaceutical Chemistry, presently, teaching at Shri RNS College of Pharmacy, Gormi, Bhind (M.P.). He has to his credit twenty-seven years teaching experience at undergraduate and graduate levels both in Indian Universities and abroad. He has published more than twenty research papers based on pharmacological studies on natural and synthetic drugs in international and national scientific journals. He has taught at School of Pharmacy, Addis Ababa University, Addis Ababa (Ethiopia) (2002-2005); Guru Jhambheshwar University, Hisar (India) (1999-2002); Al-Arab Medical University, Benghazi, (Libya) (1997-1998); College of Pharmacy (University of Delhi), Delhi (India) (1990-1994); and, Faculty of Pharmaceutical Sciences, University of Nigeria, Nsukka (Nigeria) (1976-1987). Professor Kar has an excellent track record in academic institutions of high repute, and actively engaged in teaching, research, administration, and service to his profession. He has to his credit more than fifty research papers, and guided several PG/Ph.D., students in Nigeria, India, and Ethiopia. He has bagged the University Gold Medal in B. Pharm., and M. Pharm., examinations from the University of Saugar, Saugor (M.P.) and completed his Ph.D. He is the life member of several national professional bodies like: APTI, IPGA, and ISTE. Professor Kar has been conferred with 'Lifetime Achievement Award, 2008', by the Indian Association of Pharmaceutical Scientists and Technologists, Kolkata for his immerse contribution in the Indian Pharmacy Profession on the 19th January, 2008. Professor Kar has completed nine textbooks, namely: "Medicinal Chemistry (4th/Edition: 2006)"; "Pharmaceutical Drug Analysis (2nd/Edition: 2005)"; "Pharmacognosy and Pharmacobiotechnology (2nd/Edition: 2006)"; "Advanced Practical Medicinal Chemistry (2004)"; "Pharmaceutical Biotechnology [2005 (HB) & 2006 (PB)]"; "Pharmaceutical Microbiology (2006)"; "Pharmaceutical Pharmacology (2009)"; "Pharmaceutical Analysis Volume I (2007)"; and "Pharmaceutical Analysis Volume II (2009)". Besides, Professor Kar's ten year stint of industrial experience in Public Limited Companies as: General Manager (R&D), Production Manager (Food), and Research and Development Officer has inculcated in him a tremendous in-built stimulus of sophisticated research academic laboratories both in the African Continent and top-notch Indian Universities.